There are surely few things that shout British holiday as loudly as the deck chair and whilst we are enjoying a wonderful summer, now is the perfect time to invest in the classiest seating you can lay your hands on for use in the great outdoors. Here are just a few of my favourite finds. I love all the designs from Thornback and Peel but this turquoise sardine tin seems to work perfectly on a deckchair – don’t forget the matching cushion! House of Hackney‘s fab fabrics give their deckchairs a decided air of cool, and I love the Edwardian version with shade cover and stool for the perfect feet-up experience. This double deck chair from Cox and Cox is extra wide for communal relaxing – there is room for two, or more, so bag your place quickly. Liberty has joined forces with deckchair experts Southsea Deckchairs to produce these limited edition deckchairs in classic Liberty print. Available for one season only, so buy now to avoid disappointment! You get a little piece of history with these deckchairs from Plum and Ashby as each frame used to be used on the sea front at Weston-Super-Mare and has now been given an overhaul with a new seat in their charming Bertie print. Life is indeed beautiful with these chairs from Rockett St George with their upbeat messages. You Are My Sunshine and Life is Beautiful – but which will you choose? – I recommend both to be on the safe side. And finally whilst this is not a deckchair, I couldn’t resist tempting you with this wonderful covered Rocker Swinging Seat from House of Hackney. Couldn’t you just snooze on that until the Autumn? 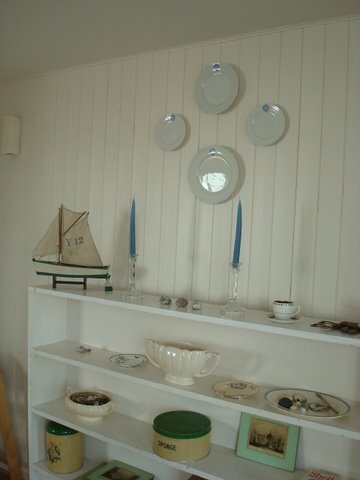 How pretty is this seaside-style blog post by The Paper Mulberry. When we received an email to let us know that The Paper Mulberry had used one of our images in a blog post we hopped over to take a look and what a discovery! This pretty blog is filled with evocative, dreamy moodboards of gorgeous interiors and pretty colour combinations. Click here to see the rest of the post and for full image credits. And extra points if you can spot the Angel + Blume image in the moodboard above. Booking a holiday in the UK? We can highly recommend this beautiful property literally on the beach and with Angel and Blume interiors to boot! 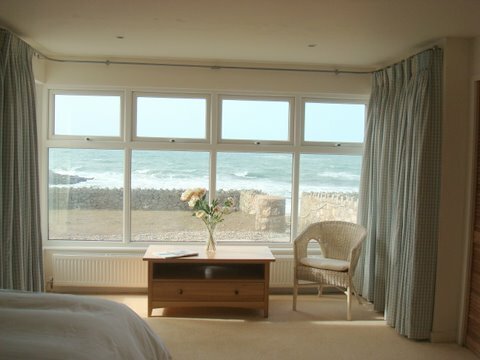 Located in Rhosneigr in Anglesey, it is the perfect escape for a family or group of friends. We designed the interior of this property three years ago when it was built on the plot of an old family property and it has all the mod cons you could possibly need. If you love UK beach holidays, you won’t find a better location or a more luxurious house than this one. See more at Rhosneigrbeach.